Remember how she looked back in June? The project came together in a handful of layers over a period of four months. First, a slab of Indiana Gray limestone on the hearth. Next, new “bones” that created a frame that stretched all the way up to the ceiling. After that, a little bit of new wood and a little bit of super old wood (the horizontal blue-gray planks). After that, new bricks and a rustic mantel beam made from 100-year-old heart pine. 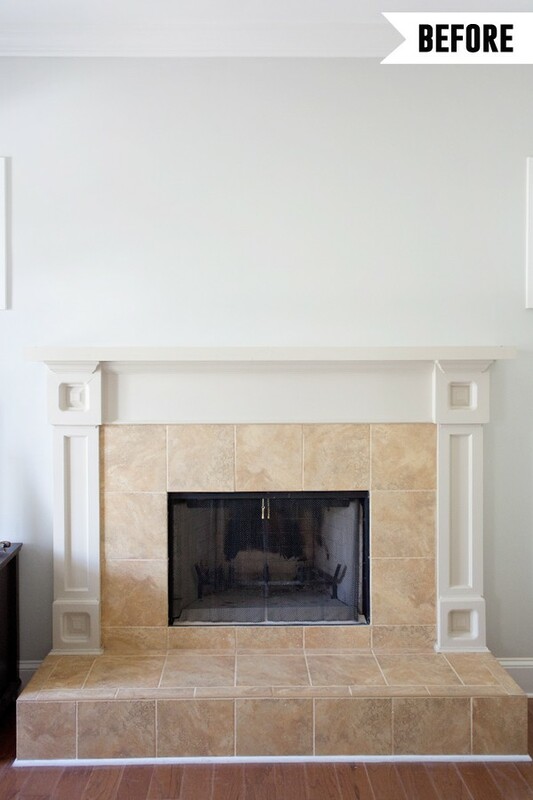 Last but not least, a new (Simply White) mantle surround. I had hoped to find an antique mantel surround that we could use, but after looking around at local salvage and antique shops, I discovered that fireplaces were usually taller and not as wide back in the day. Brian the Carpenter built our surround for about a hundred bucks in materials, and we added my old corbels to give it a little antique character. (I’ve had them for a couple of years, and was so excited to finally have a place to use them!) 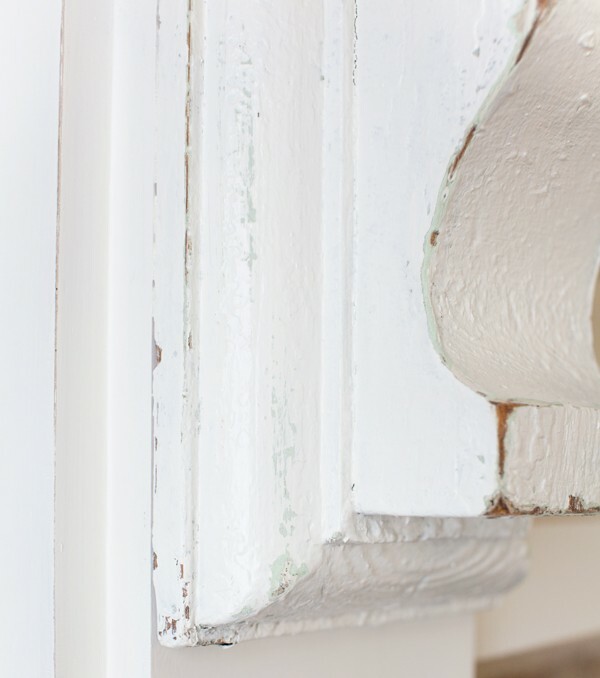 I painted them Simply White to make it look like they were always a part of the mantel, but distressed them with a sanding block so a little bit of the original mint green showed through. We’re going to spend the rest of the year working on the built-in storage I have planned for each side of the fireplace. I’m excited to finally put all that wasted space to work! 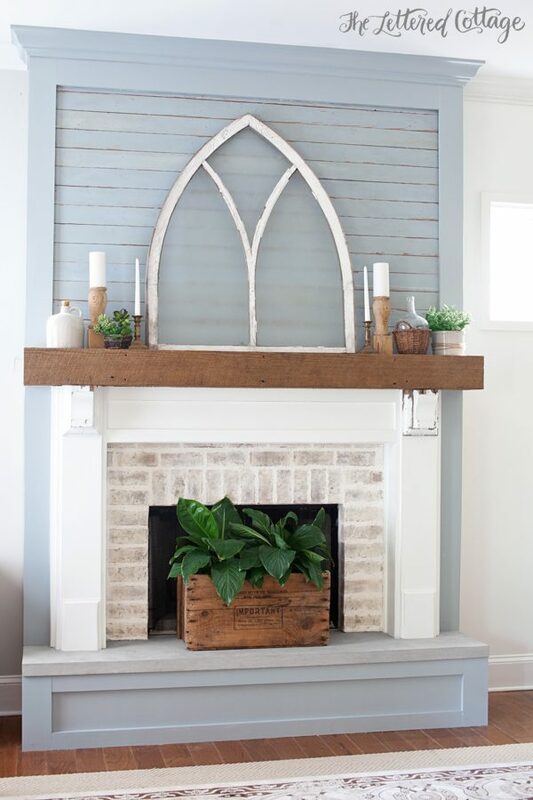 PS- Click HERE to check out any of my previous fireplace makeover posts! Awesome. I hope tomorrow you have good news about Sweet P! Do you have plans for the opening when the Peace Lillys are gone? Beautiful transformation. Your fireplace looks amazing!! 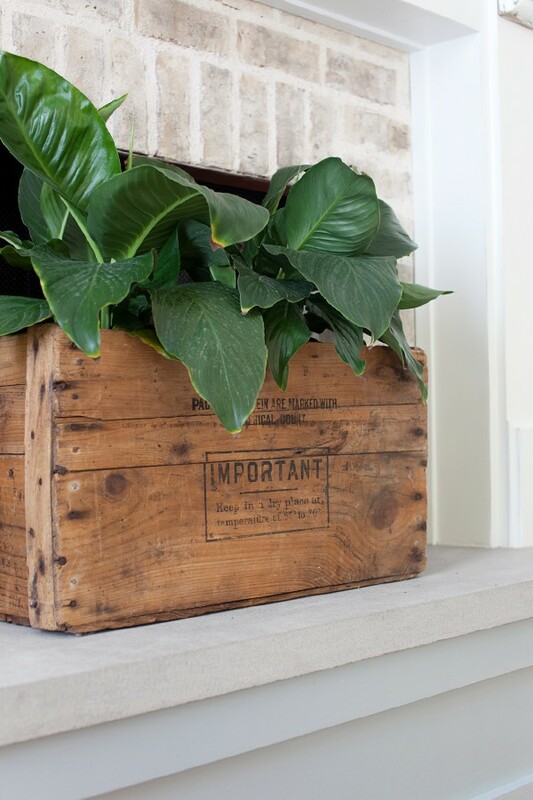 You’ve succeeded in adding all the perfect farmhousy/southern touches that it needs to be in your house. So beautiful, what an amazing difference in the “after” photo! What a great transformation! It has so much more character and beauty now! Love how you used the corbels. It’s beautiful!!! 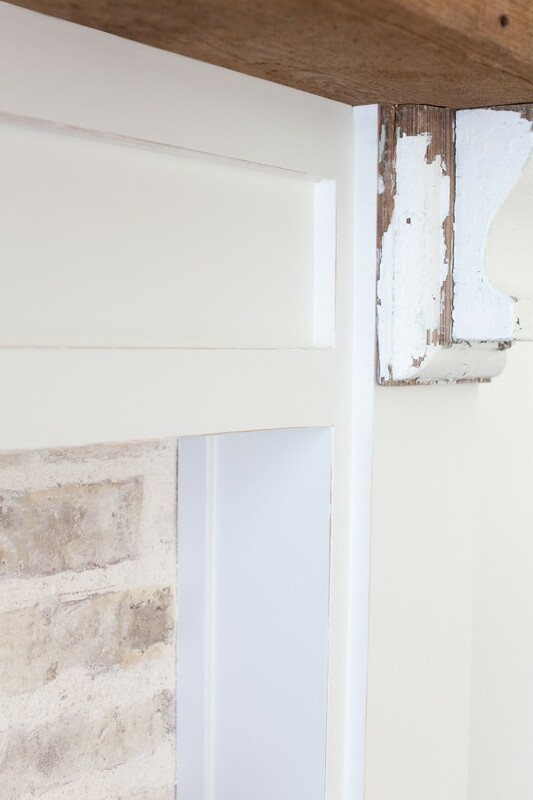 The bricks, the corbels, the old boards and new surround – all perfection together. Love it Layla!! Really nice! And I love your fireplace quote on this post! Well I knew I would LOVE it, I always do! But the colors, the wood and that BOX! It’s just perfect Layla and Kevin! And nicely done Brian the carpenter! Seriously good! Love the gift you have to “see” something like this and make it come to pass. Must make you smile when you sit in the room. Awesome! Can’t wait to see the completed wall! Looks fantastic! Wish I had a fireplace. Strangely, my cats adore shredding the leaves of my spathiphyllum. The only reaction they seem to have is like the one they get with catnip. Pamela, Layla was assuring us cat lovers because lilies are not just toxic, but fatal to cats. Thank you Layla and the fireplace is beautiful! It all turned out just beautiful! ? Both the before and after are awesome. You did a great job of getting the look you were after…. It’s stunning! It was so much fun watching this project evolve, seeing all the treasures you discovered to use for the project and to watch the transformation in stages! Thank you for taking the time to post all that was involved. I hate how “easy” TV shows, magazines and some blogs make the process seem! What a transformation- you and your someday soon family will enjoy this for many years yet to come! Can’t wait to see your seasonal decorations through the year! Beautiful! 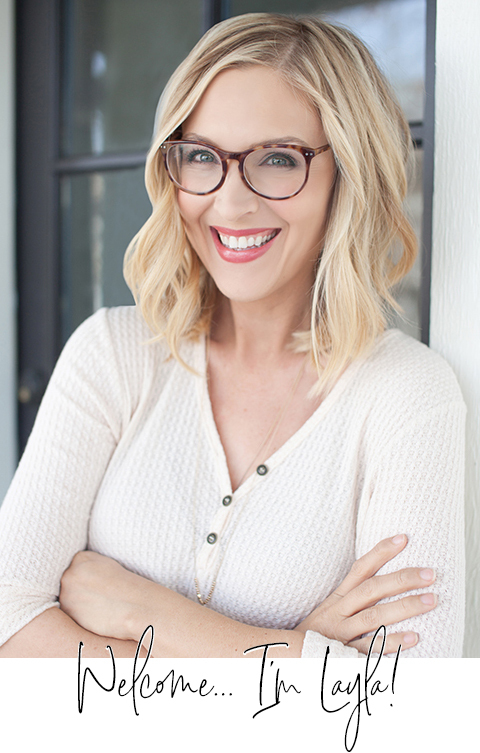 I loved seeing how it all came together – such a wonderful difference between the before and after. Have a great weekend! This is absolutely gorgeous! After reading this, I clicked on your “Our House” tab, and I was overwhelmed at what a beautiful difference you and Kevin have made in your home! I’m sure you have a lot on your plate these days, but is there any chance you could give us an updated house tour post? I love seeing befores and afters, and yours are stunning! Still praying for you and your Sweet P. Much love! What a fantastic transformation!! It all looks simply beautiful, but the brick is a special standout. Congratulations on an another creative masterpiece! And thanks so much for sharing. Such a clean and soft look which appeals to me. Wow, that looks fantastic! I bet you are beyond the moon pleased with it! Love the brick, love the whole thing! Betsy @ Happily Ever After, Etc. Wow! I love love love it! What a stunning transformation! Plus I love the blue… so awesome! This look is absolutely perfect. And that mint peeking through on those corbels! Wow! I can already imagine Sweet P and your family sitting on that hearth for Christmas photos. Well done. Just beautiful my friend!! Love every bit! WOW! Looks wonderful!! I love it and it suits your style and home so well, it looks awesome now. Came out exactly like your inspiration. Gorgeous! Do you mind me asking what color the blue is?